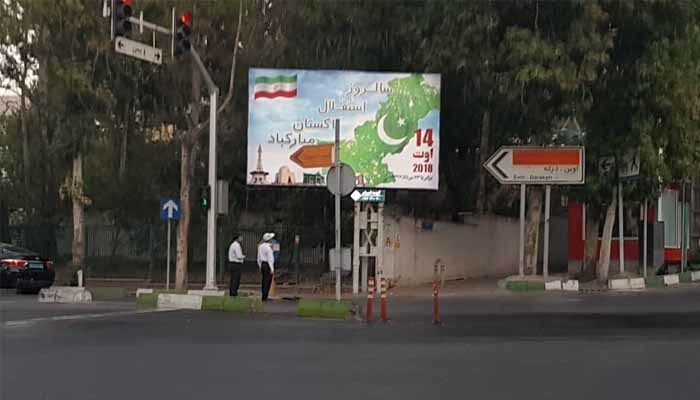 TEHRAN (DNA) – Pakistan’s Independence Day is being celebrated in Iran, with local administration in several cities adorning the public places with Pakistani flags and banners and hoardings inscribed with Happy Independence Day in Persian. A senior correspondent of Pakistan’s leading English daily on Tuesday shared four pictures on his Twitter account saying the photo graphs were received from Pakistan’s Embassy in Tehran. Quoting the Embassy, the journalist said it is the first the Islamic Republic is celebrating a foreign country’s national day at “this scale”.